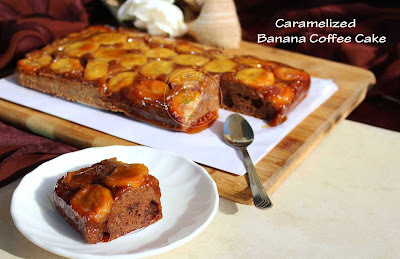 Please check the above video showing how to make a caramelized banana coffee cake. Preheat the oven to 180 degree C. Grease a square baking pan (or a springform pan ) with butter and dust with flour. Set aside ready. Keep the eggs and butter at room temperature (very important while baking). First, make the topping of the cake. So let's Caramelize the banana. Heat butter over a medium-low flame and when it starts to bubble add the brown sugar or jaggery powder. Whisk continuously until the brown sugar has melted completely. Add the vanilla essence, mix well until it is well incorporated. Remove from heat. Pour this sauce into the prepared cake pan and coat the base evenly. Arrange the bananas on the top of this caramel mixture closely to each other (each slice must have minimum thickness). 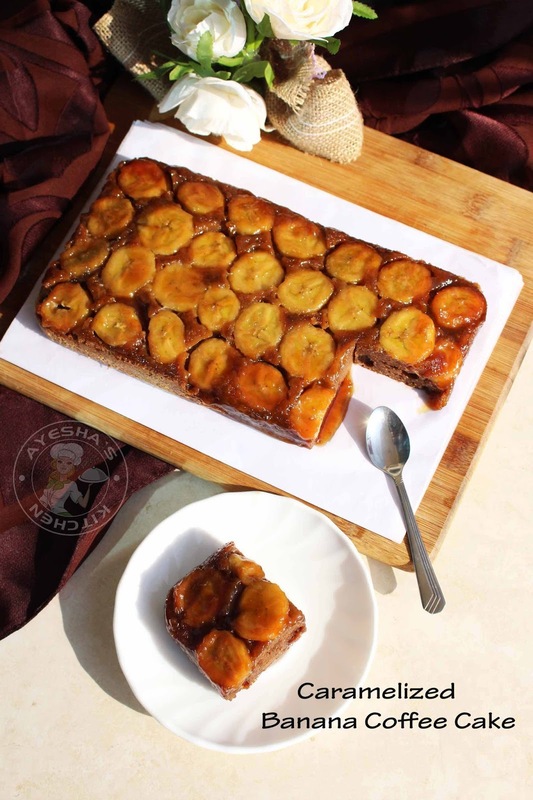 You can use ripe plantains instead of Chiquita banana. Caramelized ripe plantains taste best than Caramelized Chiquita. Set aside. Now make the cake batter. For that prepare half a cup of strong coffee and set ready. Sieve together All-purpose flour, cocoa powder, baking powder, and salt. Mix to combine and set aside ready. In a large bowl, beat the eggs and sugar until light and fluffy with an electric beater. Add the softened creamy butter (in a bowl, cream the butter with a spoon before adding to the egg mixture). Again whisk well using the electric beater. To this add the hot coffee and vanilla essence. Whisk well. To this stir in half of the flour mixture. Fold with a spatula or a spoon(do not use electric beater at this stage). Once done, add the remaining flour mixture. Fold well to combine. Pour this batter over the bananas and spread evenly. Place it in the preheated oven and bake at 180 degree C for 30 to 40 minutes or until a toothpick inserted comes out clean. (the baking time depends on the oven used. Some bakes cakes at 150 degree C for 30 minutes only). Once done, transfer it to a wire rack and let it stay aside for 3 minutes. Run a knife around the sides of the cake and gently flip the cake onto a serving plate. Enjoy. 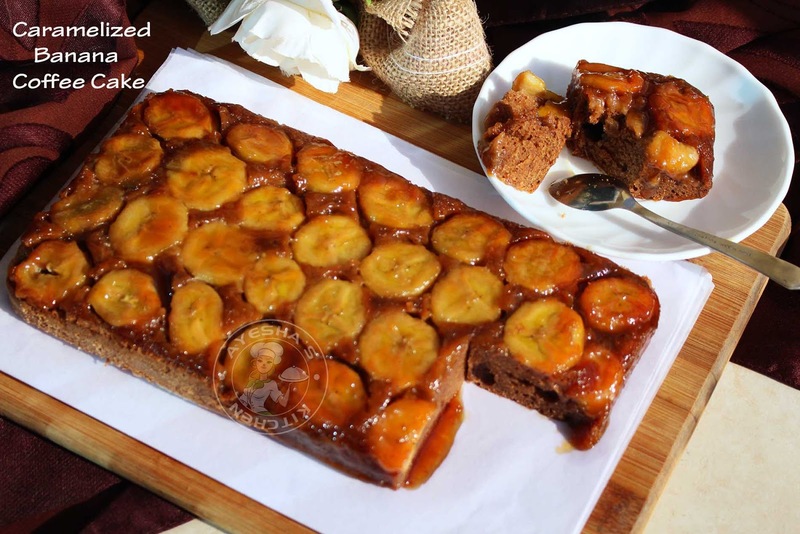 It tastes best on the day it is made as the banana looks mushy the next day.